Consumers are now watching their movies on streaming services powered by Amazon and iTunes, but also want all of the bonus content such as deleted scenes and behind-the-scenes footage that would be on the Blueray DVD. 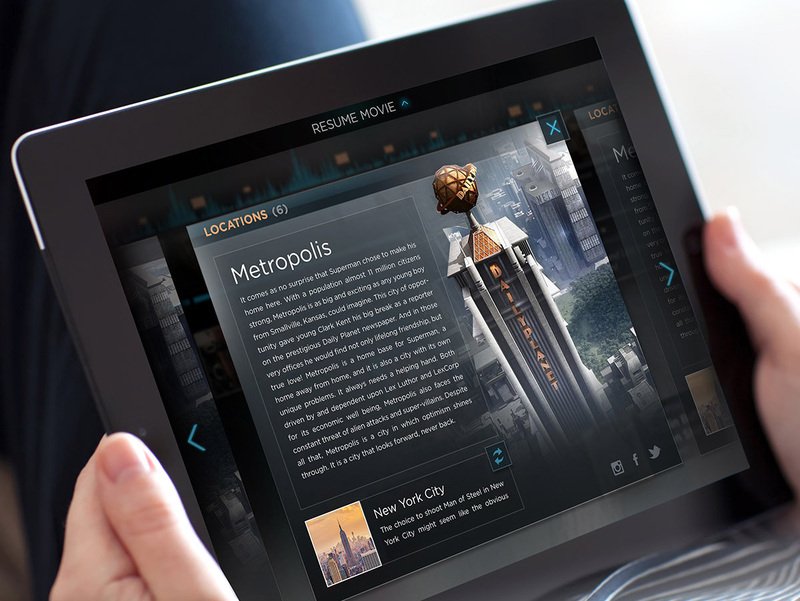 Warner Brothers wanted to design a premium entertainment product with an intuitive UI that communicates the excitement and cinematic quality of an interactive movie. Our proposed solution leverages many of the advantages of using a second screen device, such as a tablet or phone, that allows the user to shift easily from "hands off" Watch mode, and "hand on" Learn mode. 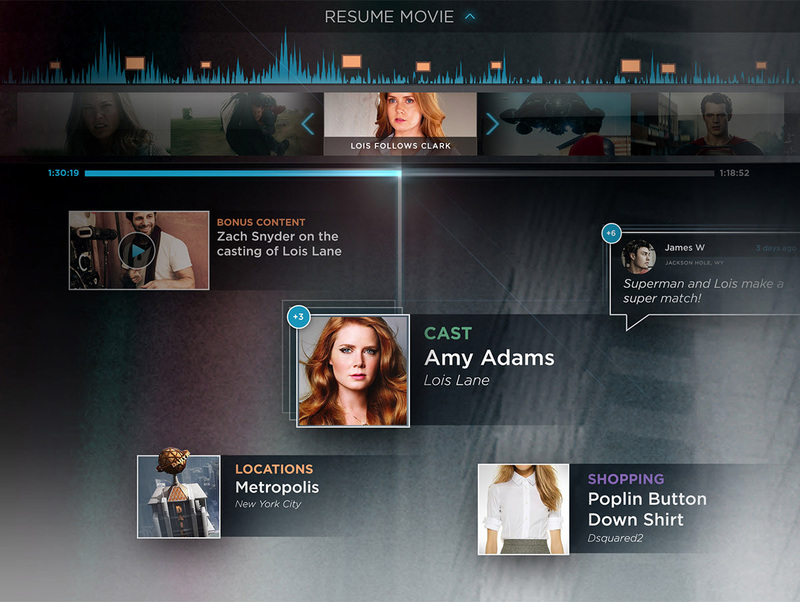 At the core of the interactive movie, is to give the user the ability to easily access featured content at any time. When the viewer taps “Watch now”, the movie slides up and begins playing in the clean state (no other content is shown). Tapping anywhere on the screen during playback pauses the movie and reveals a progress bar that includes a small sampling of scene-specific content. Tapping again takes the user to the Enhanced Timeline which reveals ALL scene-specific content with opportunities to deep dive into a variety of features. Tapping a piece of content opens the detail view as an overlay on top of the enhanced timeline. The viewer can swipe horizontally for quick access to other scene content, which follows the same pattern as the start screen for navigating between like content. Within the detail view for characters, the viewer can tap the “flip” icon to view the actor detail and vice versa. No matter how deep the viewer navigates, he can always get back to the movie with a single tap: the “Resume Movie” CTA is presented clearly at the top of the viewport.